You know you’re Paleo when you get really excited to find pet bones in the freezer section, and you don’t own a dog. 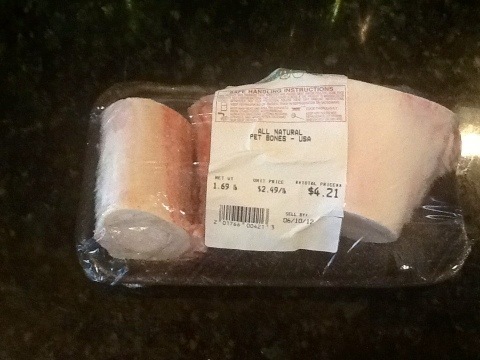 I found these marrow bones at Earth Fare (for my local readers they were in the small freezer by the meat counter). I wanted to try out a recipe for pork ribs that called for beef broth, so I needed to make some. Making broth is so easy that I can’t imagine buying it anymore. Well, the ribs were fantastic, but I got in a hurry and forgot to take pictures (hides head in shame). I’ll make them again soon. I love how beautiful a homemade broth is. 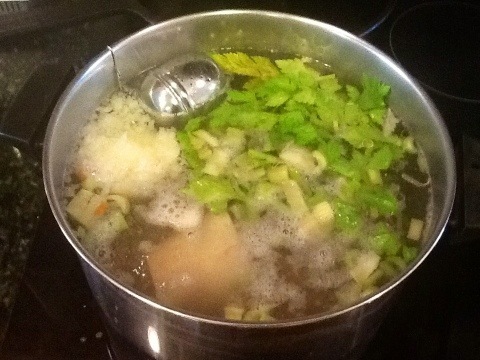 The Weston Price Foundation has a lovely and informative article on their website entitled “broth is beautiful”. 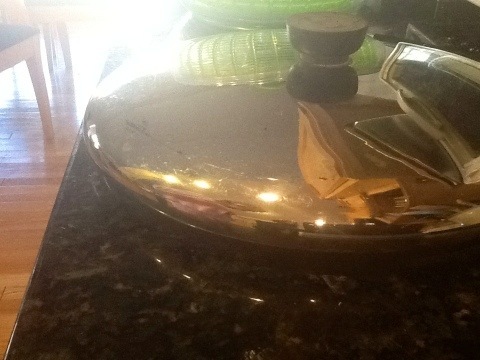 My family appreciates the smell of homemade broth simmering on the stovetop or in the slow cooker. Dora especially notices cooking aromas. She was disappointed this afternoon to find that what she thought smelled like fresh baked cookies was just a cup of green tea I had earlier. 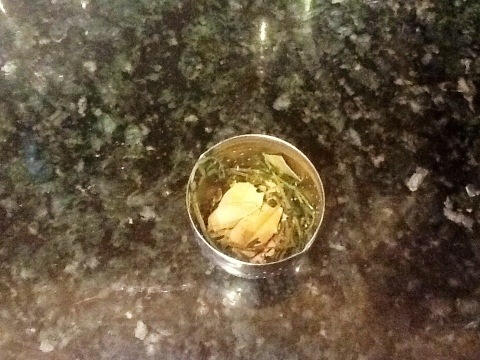 I couldn’t find the little cheesecloth bags I had bought, so I ended up putting my herbs in a tea ball. This worked just fine and is a waste-free method. I also added chopped celery and carrots. 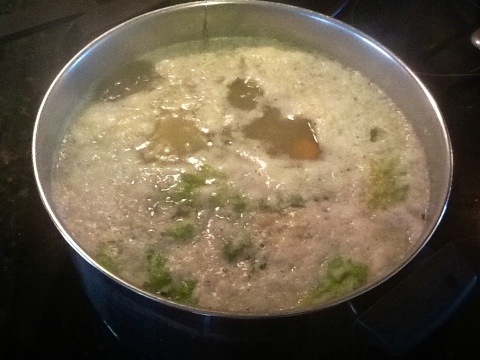 Celery leaves are a flavorful addition to stocks. I freeze the smaller celery stalks and the leaves for use in stocks. 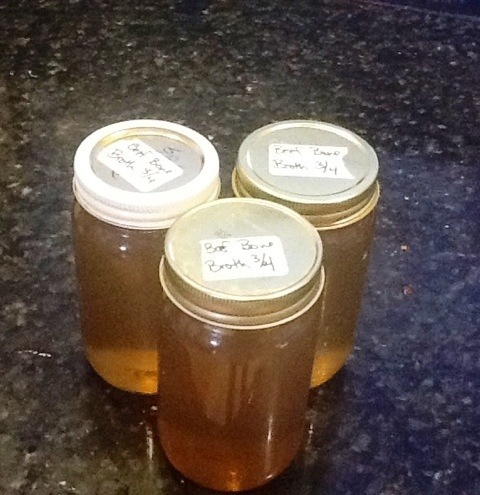 I’m trying to get in the habit of saving my leftover bones for stock as well. It is normal and expected for a layer of scum to form on the top. Just skim it off with a spoon. Simmer a beef broth at least 6 hours, but it’s even better to let it simmer overnight in a crock pot. Pour it through a colander lined with cheesecloth. 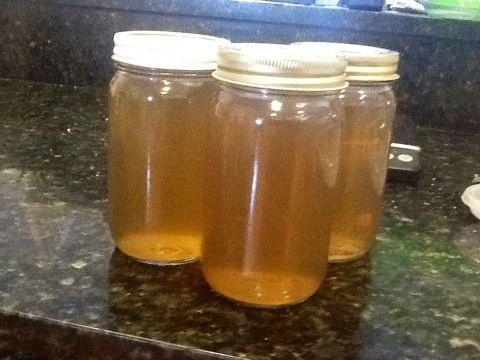 Stock will keep for a few days in the fridge or a few months in the freezer. 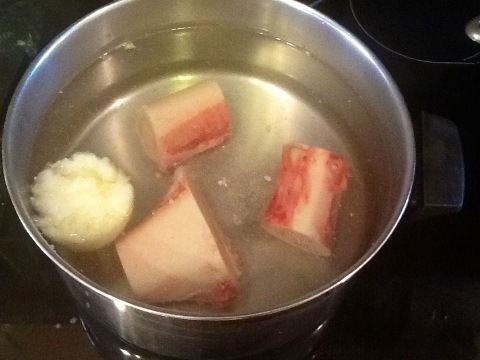 If you use leftover bones or can acquire free bones from your butcher, homemade stock costs pennies to make! Did you know that the sense of smell is the sense most keenly tied to memories? I want my girls to think of home when they enjoy a homemade soup when they grow up. I also want them to think of cooking from scratch as a normal everyday part of life (as I grew up thinking), and I hope that they too will pass it on.